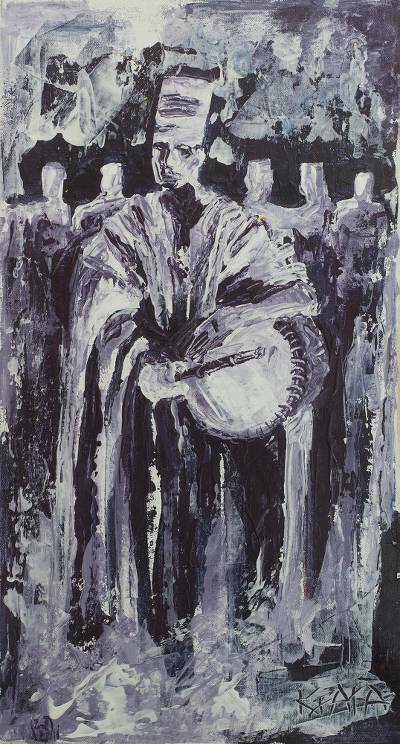 Signed Impressionist Painting of an African Drummer, "Sound of Music"
Celebrating the musical traditions of Bolgatanga, Ghanaian artist K. Baka paints this impressionist composition to depict a royal musician. Wearing a traditional smock, the subject holds a conga drum under one arm, performing for an audience. Baka uses a contrast between blue and white for this striking painting.